Today I was told I could keep my licence and I probably wouldn’t have to be reassessed in the near future. Mind you, I did the driving assessment while in severe pain and after a night of no sleep due to aforementioned pain. It has been a painful time in my life. I’m also still very cross about being made to pay for the whole thing, but there you go. Peeps, I am no danger to you on the road. The Boy came home from the office with news that the muffins were well received and a nice piece of rump steak. To clarify, the steak didn’t come from the office. It came from our local butcher, John Harbour. The Boy had decided we needed a bit of high living for a change and this would fit the bill. He also brought home a bag of spinach and some mushrooms – which was very thoughtful. So, I put some potatoes on to boil for a mash, sliced up the mushies and dug out my cast iron grill. Now, it wasn’t a massive steak, but it was a very good quality one. 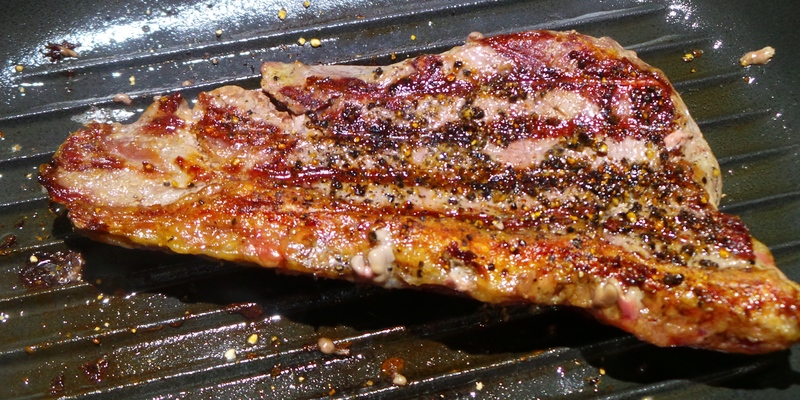 I covered one side with a few sea salt flakes and a whole heap of freshly ground pepper and grilled it until it reached our level of perfection -we like it crispy on the outside, and moist-but-cooked-through on the inside. 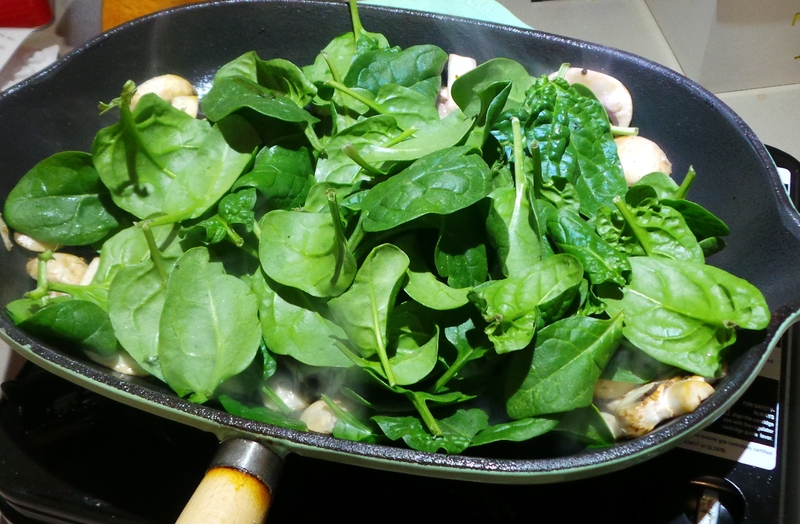 Then, I put it aside to rest for 5 mins while I used the grill pan to sauté the mushrooms, before adding a few good handfuls of baby spinach leaves and a shake or two of nutmeg. Waiting for the spinach to wilt. 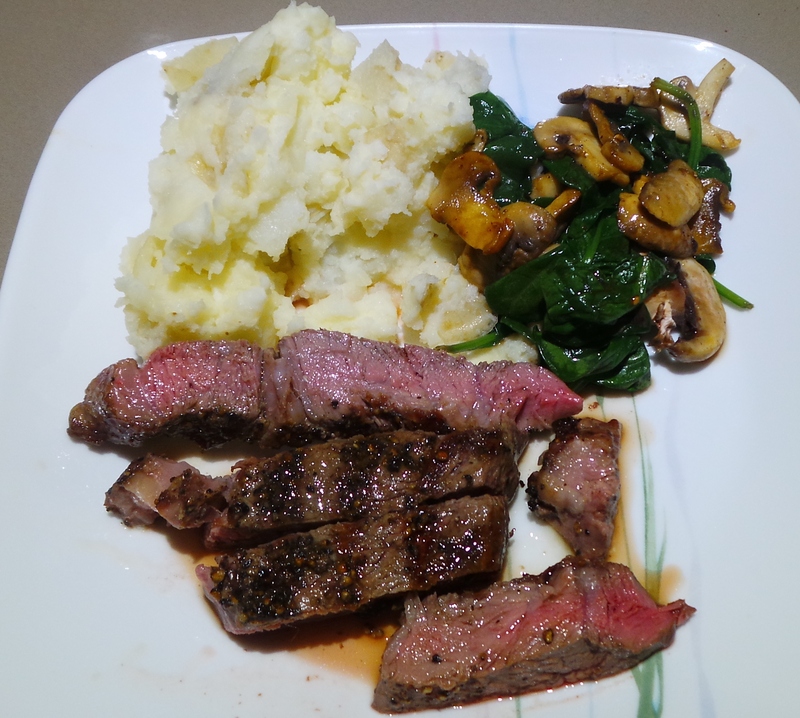 While we waited for that to wilt down, I mashed the potatoes with some buttermilk and sliced the rump. 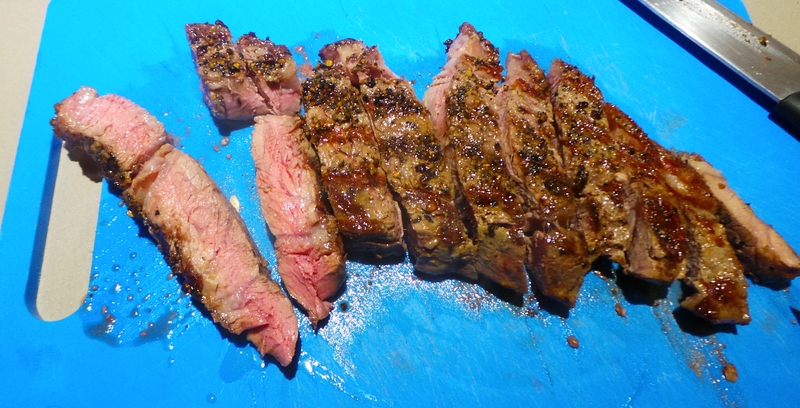 Slicing the beef gives the appearance of abundance. Then everything was plated up and the jus from the ‘resting plate’ was drizzled over the meat. In addition, I squeezed half a small lemon over the meat and the spinach, then served. This, Ladies and Gents, was gourmet. Let me know, what you’d like. There’s a comments box immediately below this post, leave your feedback and I’ll take it from there.